An increasing number of pinch valves – which are used widely in the mining industry to control the flow of slurries – are being supplied for high-pressure applications. Germiston-based pinch valve manufacturer Corflex MD Chris Webber believes engineers should be made aware of this trend, as the forces required to close pinch valves and ensure they do not leak are immense. Pinch valves use pinchers to close down on a sleeve – usually thick rubber with steel or fabric reinforcing – to form a seal and control the flow of material. Webber adds that the strength of a pinch valve sleeve is dependent on the reinforcement used in its construction. The larger the pinch valve, the more pressure is required to create a seal and ensure that material in the piped system does not seep through. “Pinch valves employing enclosed bodies should be more than strong enough to not only support the pincher mechanism but also contain the pressure in the sleeve of the valve,” Webber emphasises. The force required to shut high-pressure pinch valves increases greatly with the size and operating pressure of the valve, he adds, noting that the “only practical way to actuate a large pinch valve under pressure is hydraulically”. Traditionally, rising actuators have been used to actuate pinch valves, as this method is less expensive than the alternatives, Webber states. With this type of actuation, the pincher mechanisms are usually bolted together using nuts or other fasteners. Subsequently, safety is being compromised, as an increasing number of high-pressure pinch valves are being manufactured with only two nuts to secure the valve pincher assembly. “These two nuts take the full force of the closing mechanism.” He adds that there is a limit as to how much pressure nuts can bear before shearing. They also provide little indication as to when they are about to fail and, therefore, usually fail rapidly and with high energy. 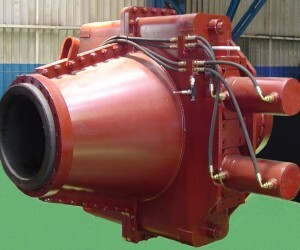 Webber says many slurry applications on mine sites use large-diameter pinch valves to control high volumes of slurries, with these valves requiring many tons of pressure to close. Critical importance is, therefore, placed on the mechanisms employed to keep the valve pincher assembly together. For example, Corflex has determined (through in-house testing) that their pinch valve of 450 mm in diameter, with operational pressures of 25 bar, requires a minimum of 77 t of pressure to shut and sufficiently seal the valve with no excess to ensure an adequate seal. The company also cites that pressure not exceeding 120 t should be applied to its pinch valve sleeve, as more force will start to damage the sleeve. He suggests that engineers, technicians and those in buying positions need to be made aware of how pinch valves can and should be assessed in terms of their safety and capability to perform high-pressure applications. Webber explains that because there are no national or international standards to which pinch valves need to comply, the result is a lack of available information to ensure their safe operation. For these reasons, the company has conducted many tests over the years to determine the pressures required to shut pinch valves of different sizes. “Corflex has been building pinch valves since 1981 and can safely claim that it supplies pinch valves more suitable for higher pressures than any other similar valve. Over the years, the company has conducted many tests on different-sized pinch valves to ascertain the actual force required to close and seal each size at various pressures,” he notes. Consequently, Corflex established curves – the minimum force required to seal its pinch valve, for each valve size and for all required operating pressures. Some of the tests were done on different sleeves of the same size, which produced similar results. “There is no reason to suppose that similar valves would not require similar forces [to close and form a seal],” says Webber. “We found that the force needed to close each pinch valve size was in direct relation to the ratio of the square of the diameter of the valve,” he says, adding that the force to shut a specific sized valve can, thus, be used to easily calculate the force required to shut other valves sizes. As a result of these tests, Corflex designed its pinch valves to handle these forces and realised that it cannot use rising actuators, as these would only use two nuts to hold the pincher mechanism together. 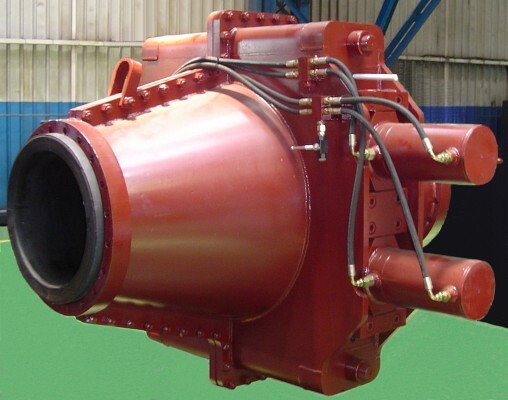 To ensure its valves can handle the high pressure of slurries, Corflex uses four high-tensile bolts to secure its hydraulic cylinders to the valve body. “It is strongly recommended that engineers buying pinch valves for high-pressure applications should conduct witnessed sealing tests to the international American Petroleum Institute’s 598 standard,” Webber concludes.